It’s just a narrow strip of low lying rocks. It barely sticks out of the sand – takes a pounding from the surf and periodically gets buried by building sands. I have walked past these rocks for years without paying much attention. That’s not surprising; they don’t look too promising. Tide pool on an exposed reef. 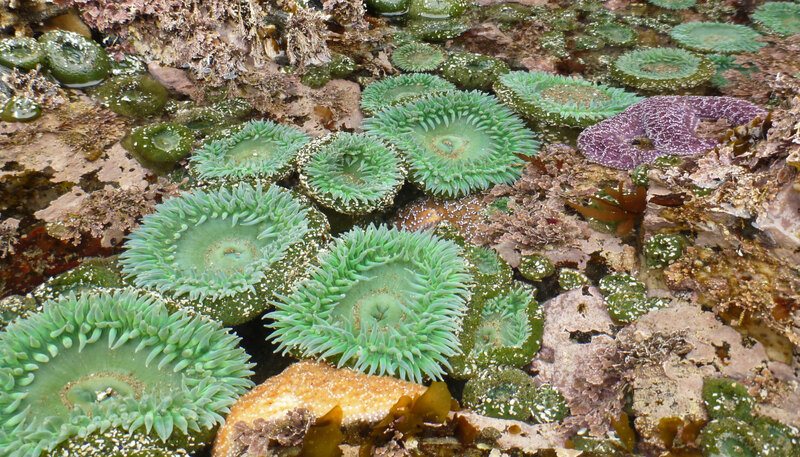 By promising, I mean big reefs and gaudy displays in crystal tide pools, like the one featured in the image above. Anthopleura xanthogrammica and A. elligantissima. 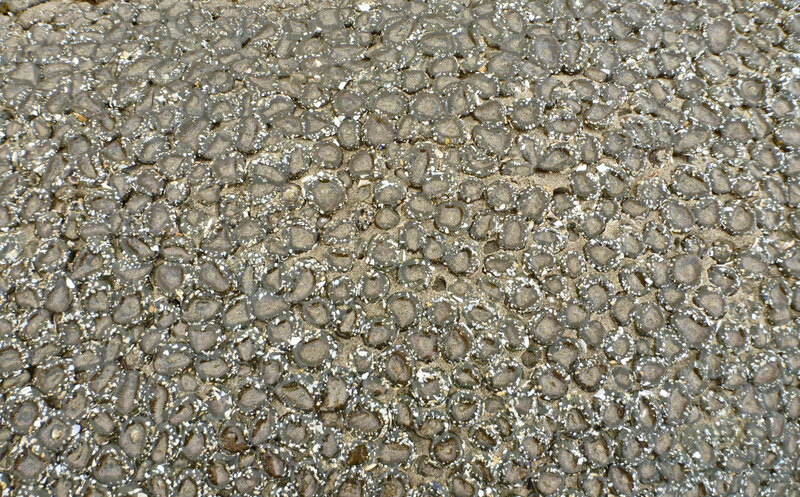 Not so on shallow rocky spines where tide pools, if they exist at all, are meager and sand scouring and sand burying are dominant themes. There are two common anemones on the low rocks featured in this post. 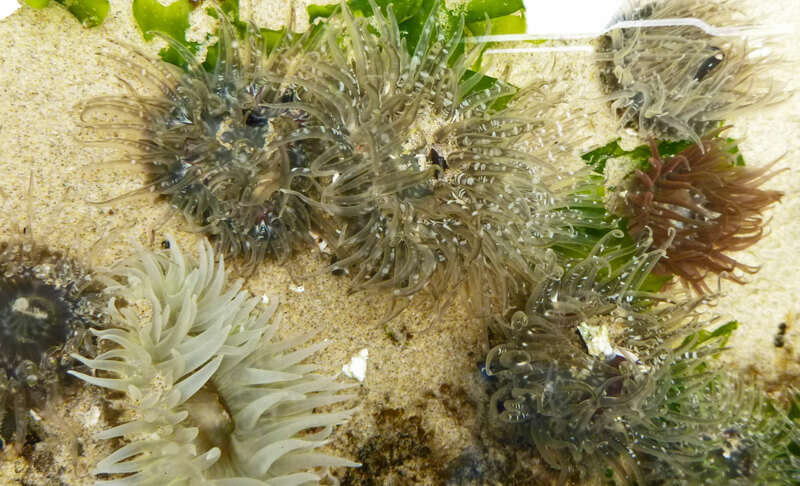 The big green one is Anthopleura xanthogrammica, a familiar tide pool anemone. It goes by common names like giant green or green surf anemone. I wouldn’t call it solitary, but they don’t crowd and can get large by anemone standards. 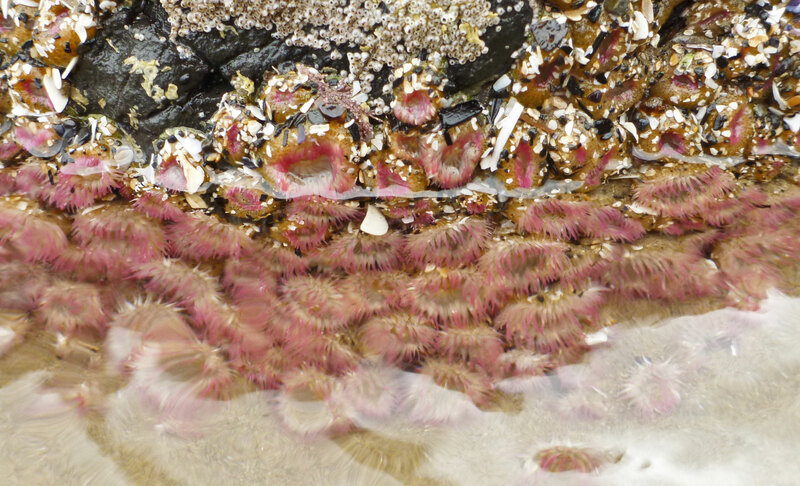 The smaller pink anemone is Anthopleura elegantissima, the pink-tipped green or aggregating anemone. They come into their own where rock meets sand. Given a pool in which to open their disks and display their tentacles, fresh colonies of spring Anthopleura elegantissima make an attractive pink contrast to their drab sand scoured surroundings. 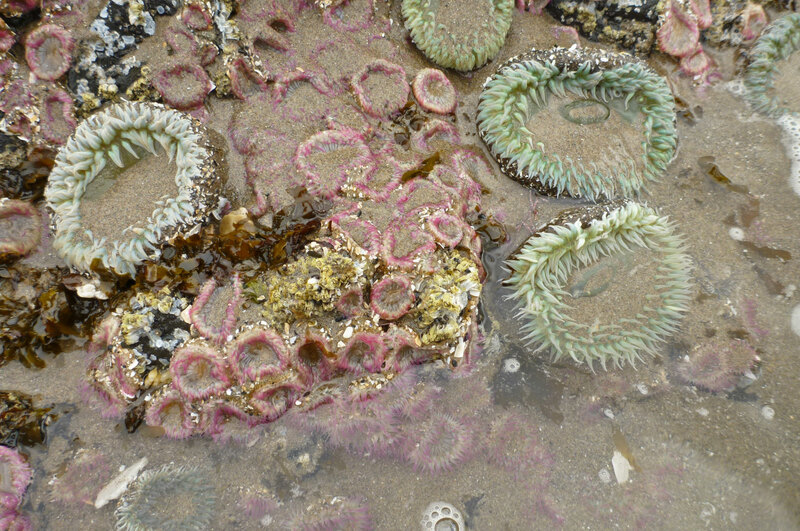 The colony in this image is exposed by low tide and the disks are closed, hiding the beautiful tentacles. At a distance the perception is that of bare rock. On close inspection it’s easy to see why people call A. elegantissima the aggregating anemone. They form dense carpets. How many do you see in this image? 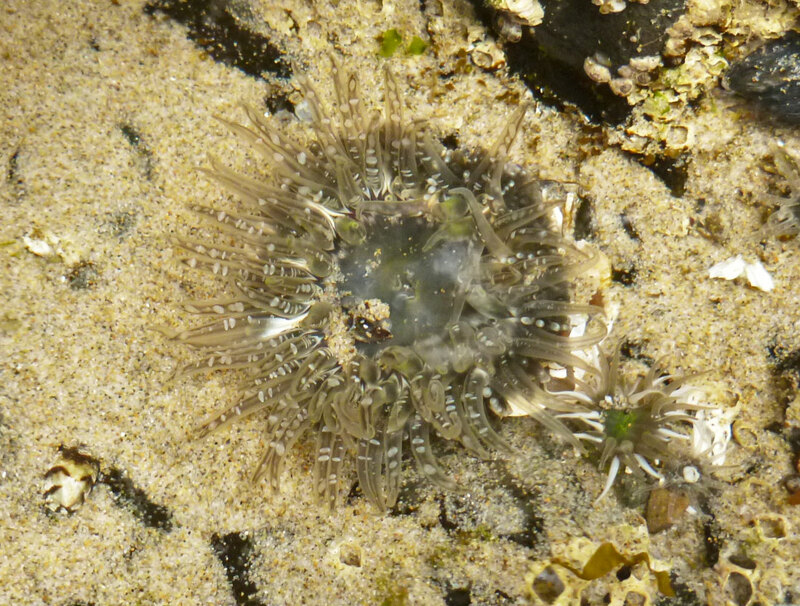 Aggregating anemones can handle the sand, but there is another anemone even more at home with sand. Anthopleura artemisia is so at home with sand and even burying that it is known as the burrowing or buried green anemone. 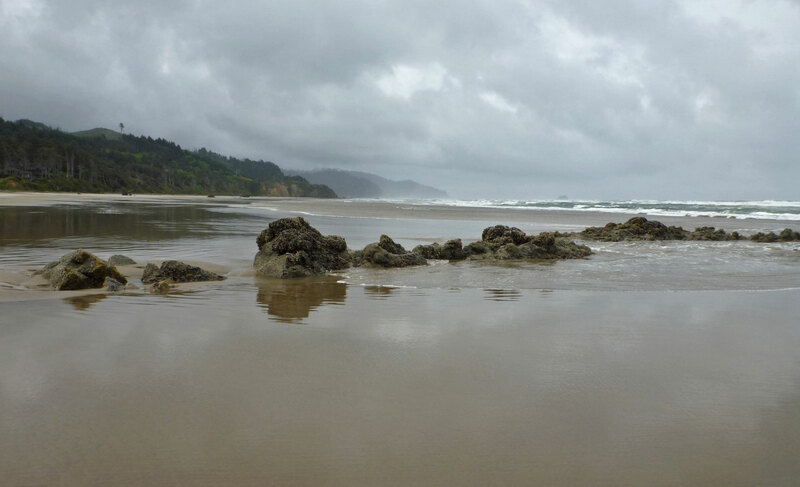 On the exposed outer coast they can be found in protected niches and shallow sand filled depressions. Wherever they are found, they seem to require some burial and all you typically see above the surface is the oral disk and tentacles. One more thing about those tentacles – because of their luminescent properties, A. artemisia is also known as the moonglow anemone.